Daughters of the formidable Isabella and Ferdinand of Spain, Katherine and Juana were born in to a world of privilege and luxury that came at a devastating personal price. They were trained from an early age to understand European diplomacy and to revere their position as defenders of Catholicism against any threat to their religion. In an age of family politics, the sisters were useful only as a way to secure new alliances through marriage; both at the mercy of the men they were to marry. Katherine's marriage to Prince Arthur appeared to go well until he died suddenly after ten months. Marriage to King Henry VIII did not result in the vital heir, and soon Henry was displaying his despotic nature, with the execution of 'traitors' and high-handed affairs. Juana fared no better with Philip of Burgundy, whose naked ambition and cruelty made her life equally difficult. 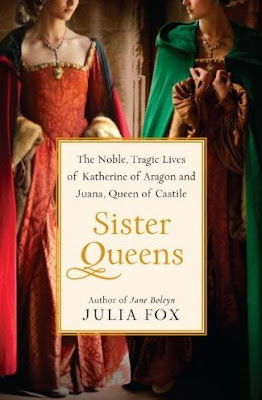 Julia Fox's new biography vividly portrays the harsh realities of being a queen within a world dominated and run by men. She provides a fresh take on the sisters' characters and interior worlds by setting them within their family and Spanish contexts. In the case of both women, this vibrant biography graphically illustrates the dangers of being a royal commodity at such a perilous time, and gives a highly revealing portrait of two forceful female personalities thwarted by the men around them - including the men closest to them who should have cared for them the most. Confusingly, there's another HF book titled SISTER QUEENS by Sophie Perinot coming out in 2012 from NAL. It's about Eleanor (the wife of Henry III) and her sister Marguerite. I was asked to blurb it, so I won't say too much about it, as I've just started reading it. NOthing like being a political pawn and womb for rent. It's going to be quite a season for Queens who are also sisters. Do I sense a trend??? Well if so, I think it is about time. After all, the relationships between sisters is primal and formative. This would probably be an interesting read. I need to get back to reading historical fiction and non-fiction regularly again! One would think that a Queen must have a pretty "cushy" life, however as we find from some of these delightful and educational novels, that is not always the case. Sometimes they are lonely, isolated and in fear of their lives. How sad. Sounds like a great novel to read. Thanks for the synopsis, Amy. Ooo, this sounds really interesting! It's so amazing that these two historical figures were sisters! As much we "commoners" may think back then was all romance and chivalry, it certainly was not. It never ceases to amaze me these two tragic figures were sisters, coming from such a strong mother. How emasculated was Ferdinand by Isabella?